(AINA) -- According to Assyrian Christian leaders in Iraq (AINA 5-10-2007), the future existence of Iraq's dwindling Christian population hangs in the balance as violence continues unabated. Moreover, direct blame has been leveled at Iraqi governmental as well as Coalition forces' inaction in the face of mounting attacks against Christian population centers. The primary focus of the community's concerns now centers on the deteriorating security situation of the Assyrian (also known as Chaldean and Syriac) Christians in the Dora neighborhood of Baghdad. 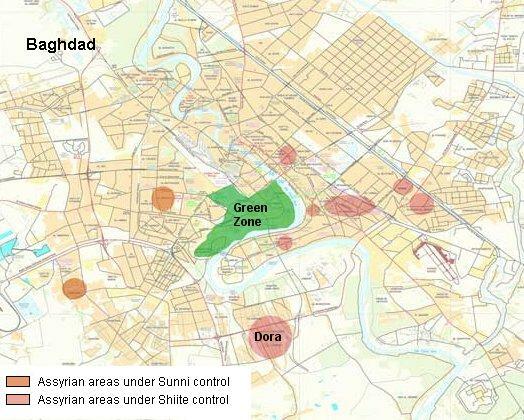 The Dora neighborhood lies 10 kilometers southwest of Baghdad. Prior to the war, the predominantly Christian neighborhood was home to over 5000 Christian households. Since the war and the subsequent insurgency, the overwhelming majority have fled the area. Some observers have noted that the recent threats and attacks have escalated proportionately as the "surge" has increased pressure on insurgents. On May 18, St. George Church was burned down by Islamist arsonists (AINA 5-18-2007). 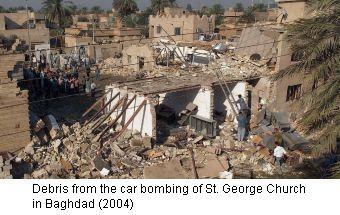 The same church had survived an earlier bombing along with 5 other churches on October 16, 2004 (AINA 10-16-2004). On May 20, Fr. Hanna was kidnapped in Baghdad (AINA 5-20-2007). In April, Christian residents of Dora were given an ultimatum to either pay the jizya (AINA 4-17-2007, 3-18-2007), a "protection" tax demanded by the Koran, convert to Islam, or leave. Those choosing to leave were reportedly not allowed to take their possessions with them as these were said to "now belong to the mosque" (AINA 5-18-2007). At least 21 families unable to circumvent the insurgent forces besieging the neighborhood have found refuge in nearby churches. The May 20 church burning has heightened fears that even churches are no longer safe for Assyrian Christians. On May 18, the Patriarch of the Ancient Church of the East, Mar Addai II reportedly stated that "only the families that agree to give a daughter or sister in marriage to a Muslim can remain" (AINA 5-18-2007). Moreover, homes not yet expropriated by force are being increasingly legally signed over by family members of hostages in exchange for their relatives' release. Despite numerous appeals to US and Iraqi government forces, Christian community leaders have not seen repeated assurances of assistance materialize. As one observer angrily noted, "Whether unwilling or unable, Iraqi forces along with Coalition forces have refused to assist us in any meaningful way. We have had numerous meetings with Iraqi and American security forces to underscore the severity of the crisis facing our people and yet have not had any response." Already viewed with suspicion by the Islamist insurgents as co-religionists and collaborators with US "occupation" forces, Assyrian Christians have often borne the brunt of reprisals by Islamists. In a rare condemnation, the Assyrian Patriarch of the Chaldean Church, Mar Emmanuel Delly lashed out against US forces who occupied Babel College, the former theological center of the Chaldean Church, without the Church's consent (AINA 5-8-2007). Mar Delly chastised the Iraqi government as well as "all those in power who did nothing and are doing nothing to stop this tragedy." One observer added, "not only aren't the Americans helping us, but they are fueling the reprisals against us by operating out of Babel College." Although some concentrations of Assyrians remain in the Baghdad area, including Hai Al-athuriyeen (Assyrian quarter), Al-jam'iya, and Al-sihha, the vast majority of the population in the country has been decimated. According to the United Nations, more than half have already left the country entirely, with still more joining the ranks of the internally displaced. In Basra, Iraq's second largest city to the south, the Christian community has almost entirely vanished. In Karkuk, Assyrians live under political pressure from Kurdish groups and under fear of all out civil strife. In Mosul, rising fundamentalism and sectarianism has caused many to flee. In the only relatively stable area to the north, many Assyrian Christians are settling in the ancient historic heartland of Assyria, in the Nineveh Plain. But here as well, Kurdistan Democratic Party (KDP) paramilitary forces harass, intimidate, and sometimes assassinate Assyrian leaders not toeing the KDP line. One leader summarized that "The KDP has opportunistically used the current crisis to squash any independent Assyrian political expression and representation." Assyrians are referred to as "Christian Kurds" and assistance is contingent on agreement to incorporate the last remaining Assyrian region into a wider Kurdish occupied region. In a bid to extend the occupation westward towards the Syrian border, the KDP has combined a "carrot" approach of assistance to a select group of refugees with a "heavy stick" of violence towards those who aspire to independent political expression. One leader lamented regarding the precarious position of Assyrian Christians inside Iraq by saying "Whereas the Islamists are attacking Assyrian population centers, the Behdanani Kurds of the KDP are attacking and subjugating Assyrian identity and national aspirations." Forced to choose between Islamist terror and Kurdification, the overwhelming majority of Assyrian Christians have simply voted with their feet and left the country entirely. With over half of the population now gone, the term genocide has slowly begun to creep into the war's lexicon. According to Jackie Bejan, a prominent Assyrian American activist, "There are many who think that we are now witnessing another cycle of Genocide, very similar to the one inflicted upon our people in 1915 by the Ottoman Turks [and Kurds]...What is happening now to the Iraqi Christians and other minorities is certainly and rapidly approaching all requirements and measurements of the most horrific crime against humanity, Genocide." Bill Weinberg, editor of the online journal WW4Report.com, squarely blames the US by describing "the inescapable reality that United States intervention created the current crisis, now approaching the genocidal threshold." Moreover, "Even if the aim was to control Iraq's oil under a stable, compliant regime, the result has been Yazidis massacred, Assyrian churches bombed, the majority of Mandeans forced into exile in neighboring countries." Finally, "more disturbingly, the United States is now presiding over the re-emergence of genocide..."
There is widespread concern about the real danger that the community will lose its critical mass and will be unable to sustain itself. One observer lamented, "By design or by neglect, the net effect is the same, the potentially irreversible loss of the indigenous Christian community in Iraq. Unless something is done and quickly the lasting legacy of this war will be the genocide of the Christians and other minorities of Iraq." Assyrian leaders are demanding immediate assistance to the besieged Dora residents. If US and Iraqi forces are genuinely unable to secure the Dora neighborhood of Baghdad, then Assyrian Christian residents wanting to flee ought to be assisted with a secure evacuation for resettlement in the Nineveh Plain in an Assyrian secured Safe Haven or Administrative Area free of KDP occupation with adequate resources to allow them to remain and survive within the country.